It’s hard to believe February is right around the corner! Today, I’m sharing an easy and thoughtful DIY Valentine’s Day gift idea you can spoil your partner, family member, or gal pal with. 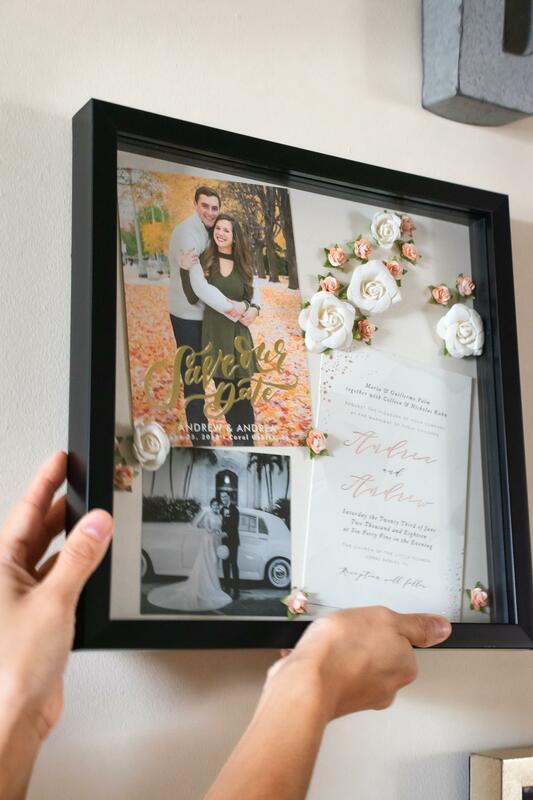 I love this DIY wedding invitation shadow box because it’s simple, yet so personal. It’s not something that will get tucked away in a closet, or that someone has too many of – it’s a unique piece that can bring someone back to their favorite day. So whether your super crafty…or not so much…this DIY Valentine’s Day gift idea is totally doable. I’ll give you the how-to below – and boom! You’ll have a present that gives all the warm and fuzzy feels. One last thing before we dive in – don’t limit yourself! I made the example below as a birthday gift for two of our best friends. 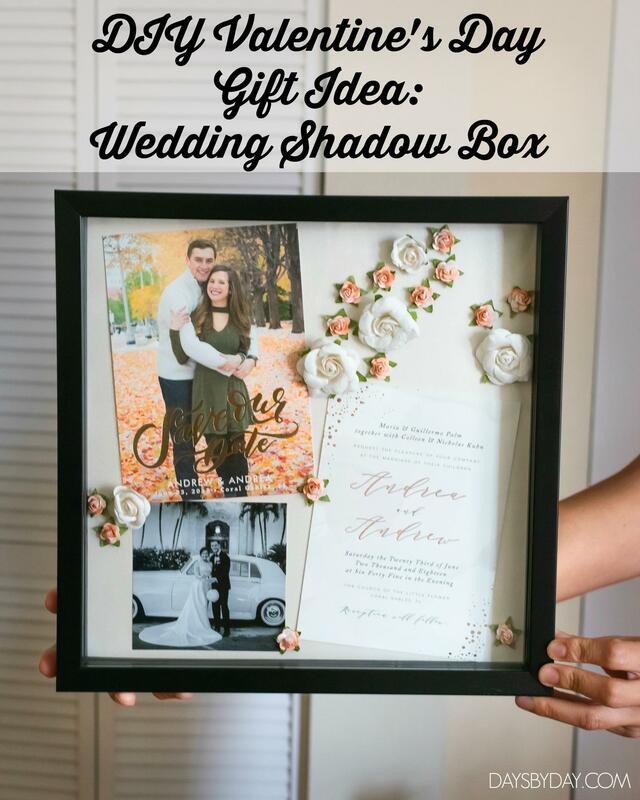 Your shadow box can be customized to celebrate multiple occasions (birthdays, holidays, showers), and given for them too! 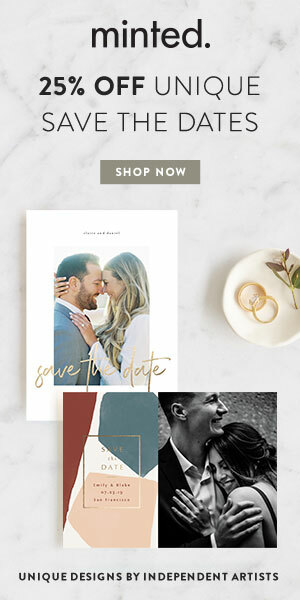 Event mementos: invitations, photos, vow books, etc. Embellishments for decoration: paper flowers, stickers, etc. *The box I got had adjustable inserts for depth, but I kept it simple and just used the fourth, furthest back part. **I think the squares are easier because they’re pre-cut, but either works! Tip: You can easily find everything on Amazon or at Michael’s craft stores! Step 1 // Plug in your hot glue gun to begin heating and unwrap/layout all your supplies, so you can easily grab what you need as you work (important for being quick when using a glue gun). Then, use the squares or the tape to mount your 12×12 scrapbook paper to the back of the shadow box. This will be the background and base for your art piece! 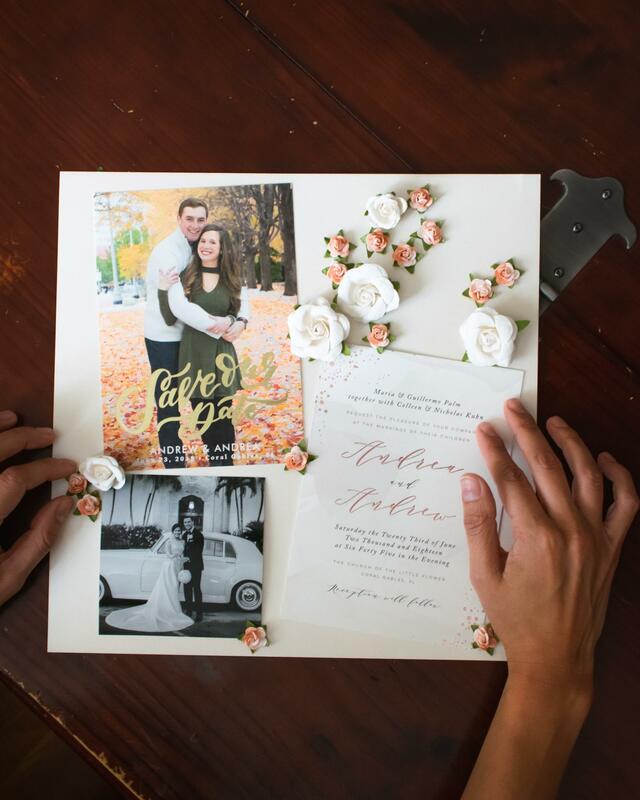 Step 2 // Begin to arrange your event mementos and embellishments on the scrapbook paper. If you’re like me, the design of everything probably won’t come together first try! 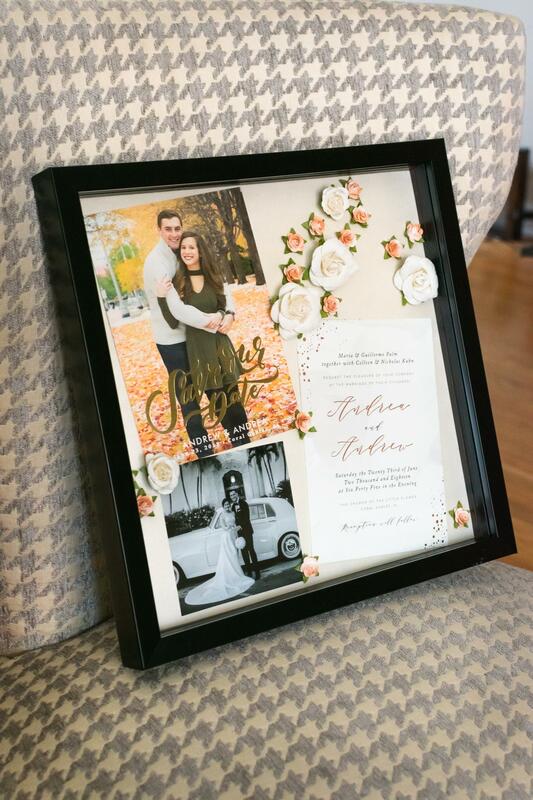 I liked playing around with my friend’s wedding invitation and photos to see what felt and fit best. Step 3 // Once you’ve got the layout, it’s time to get everything permanently set. I’m not gonna lie…I get a little nervous at this point because I want it to be perfect. So if you feel the same way, don’t worry – YOU GOT THIS. It’s art, it will always come together fine no matter what! My advice – take it slow, piece by piece. 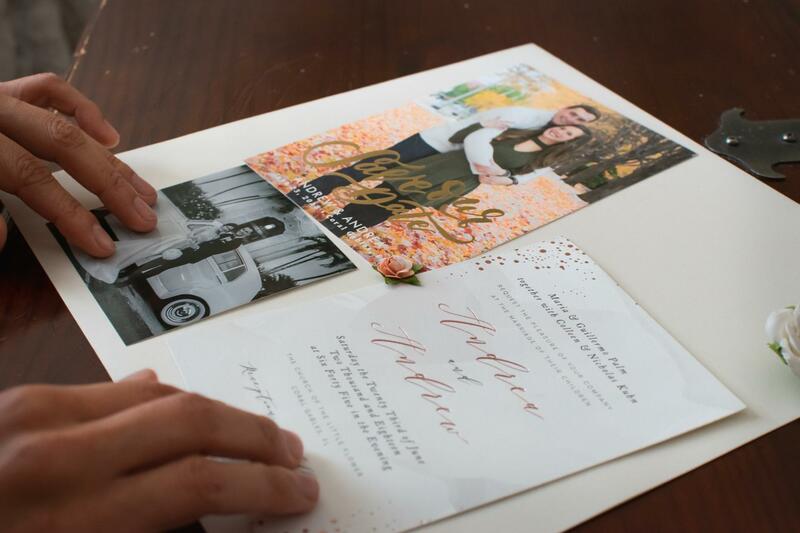 Start with the larger items first, in my case the invite and photos, as those items are the foundation. The little decorations fit around them. Once you secure the big pieces, it will be easy to set the smaller ones among them. 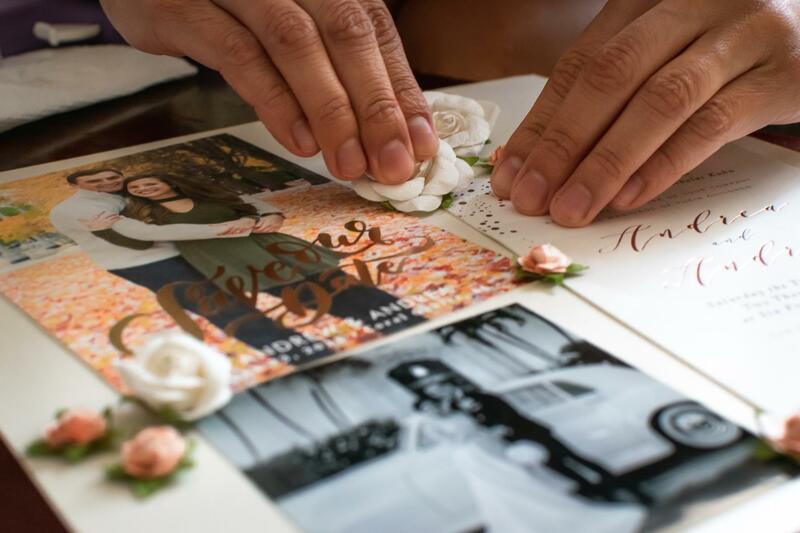 For flat items (usually any paper goods), use mounting squares or double-sided tape. 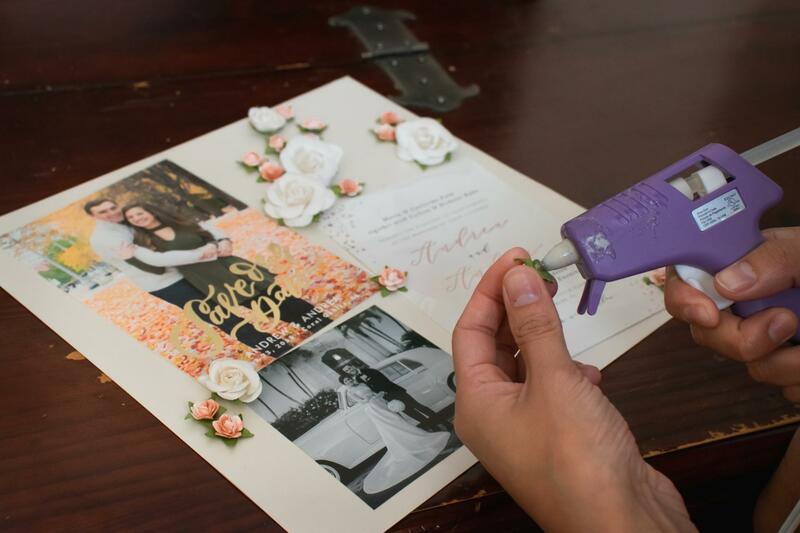 For shaped, 3-D decor, the hot glue gun is best. 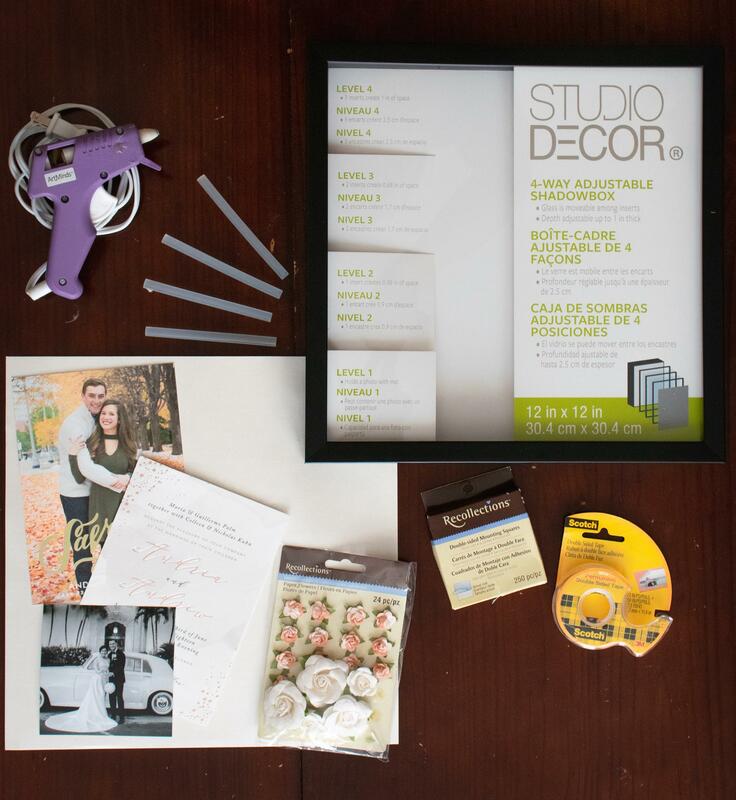 Step 4 // While your mementos and decor are settling, you can prep the shadow box by cleaning the glass with Windex to ensure no smudges block your masterpiece. Finally, gently assemble your shadow box back together and ta-dah! Your DIY Valentine’s Day gift is ready to be wrapped, or hung on a gallery wall. I was so excited that our besties loved this treat and it can bring joy around their home! 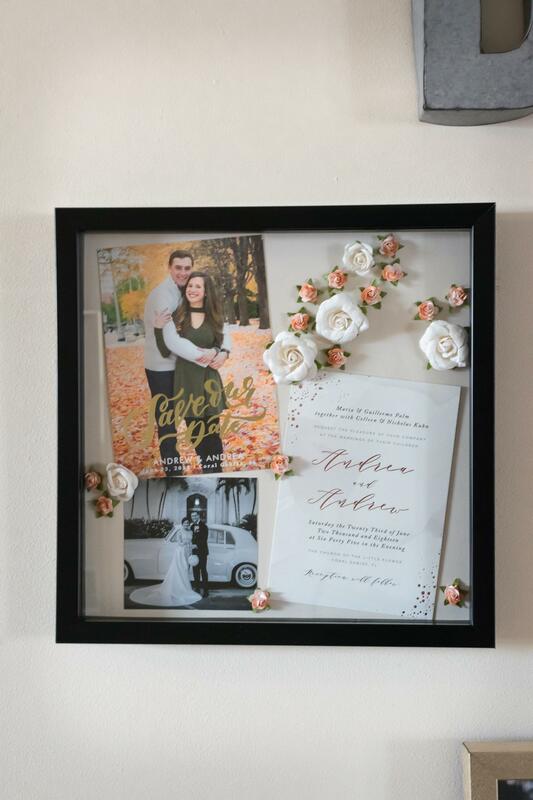 The one I made for Eric and I hangs on our gallery wall and includes our vow books instead of photos – it is absolutely one of my favorite things ever. Hoping this post brought you some Valentine’s Day gift inspiration! If you have any questions, or make one yourself, let me know in the comments or send me a note. 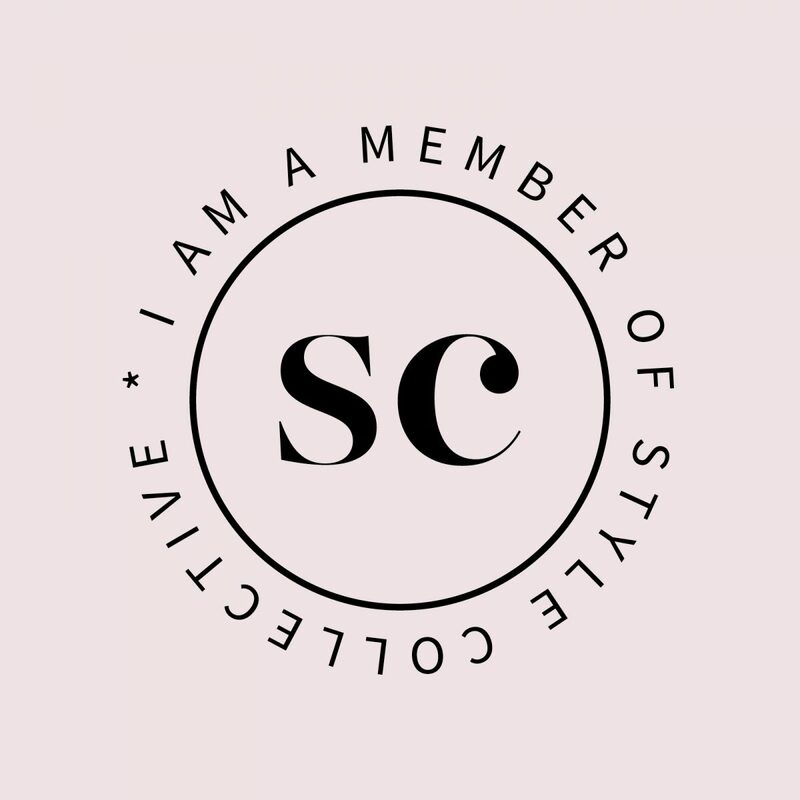 Can’t wait to see how you share the love! P.S. 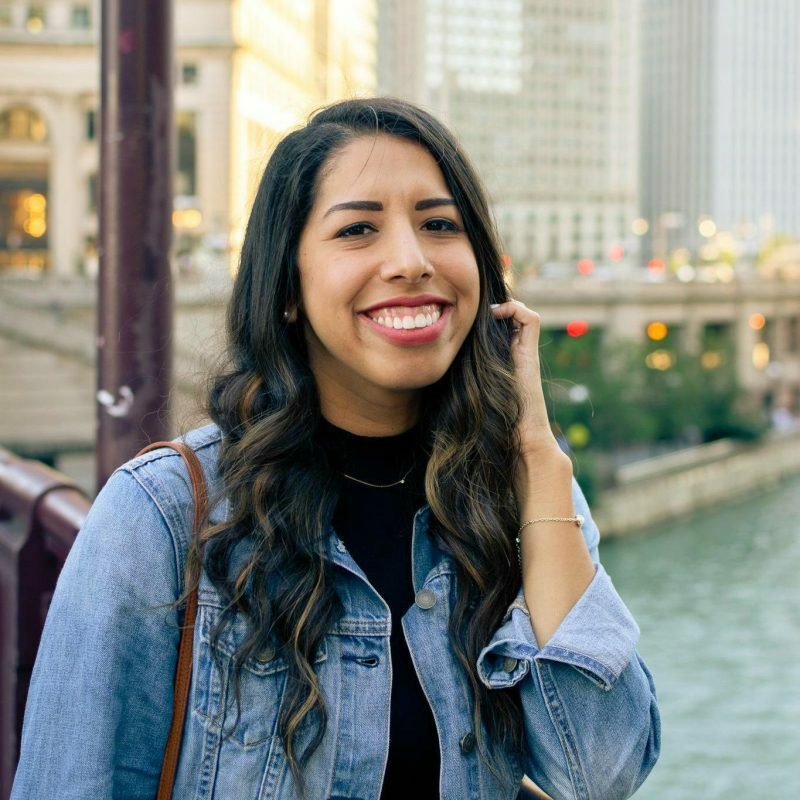 Keepin’ it real – this post contains affiliate links from the Amazon Associates Program. Don’t worry, these links reflect my honest recommendations and selections! I love the shadow box! Great idea and perfect for Valentine’s Day! Absolutely LOVE that shadow box! It would be such a thoughtful gift to give on Valentines or a wedding anniversary! I love that it isn’t a complicated DIY project either! Seriously such a fun and thoughtful gift! This is such a cute idea, I may do this for my mom as a gift for her wedding! It’s lovely and so personal! Perfect for Valentine’s Day! This is a perfect gift and so easy to put together for all of your besties! Thanks for sharing!